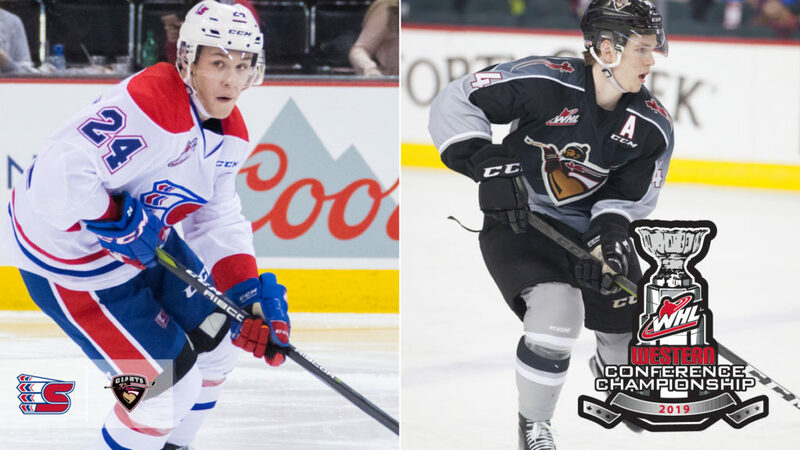 With a matching eight wins in the 2019 Western Hockey League Playoffs, the Vancouver Giants and Spokane Chiefs now serve as the final two teams standing in the Western Conference, setting up a fierce series in the Western Conference Championship. After beating the Portland Winterhawks in five games, the Chiefs dispatched of the Everett Silvertips in five contests, wrapping up their second round series with a 2-1 win Saturday. Above the 49th parallel, the Vancouver Giants won a six-game series over the Seattle Thunderbirds before sweeping the Victoria Royals in the second round. The Giants owned a 3-1-0-0 record against the Chiefs in the regular season series while the Chiefs record was reflected as 1-2-0-1. Riley Woods of the Chiefs led all players in the season series with six points (1G-5A). Mid-season acquisition Luc Smith had seven points (6G-1A) in seven games against Vancouver this season, but had three points (2G-1A) with the Kamloops Blazers. Captain Jared Dmytriw led the Giants in the season series with five points (3G-2A). The trio of Davis Koch, Milos Roman (Calgary Flames), and Dallas Hines each finished with four points to tie for second place among the Giants. Hines earned three of those points, all assists as a member of the Kootenay ICE. The goaltending battle should prove interesting as Bailey Brkin gets set to take on the tandem of 2019 NHL Draft prospect Trent Miner and David Tendeck (Arizona Coyotes). Brkin had a 1-1 record against the Giants with a 3.03 goals-against-average and a .915 save percentage. However, Brkin has raised his game for the Chiefs in the WHL Playoffs, sporting a 2.32 GAA and a .930 save percentage to go with his eight wins. In net for Vancouver, the Giants have found success with both Miner and Tendeck, opting to rotate the two throughout the first two rounds. Both have made strong cases for staying in the net with a 1.92 GAA and a 2.18 GAA respectively. They’ve also posted a .915 and a .912 SV% respectively while also collecting matching 4-1 records. This will mark the fourth meeting in WHL Playoffs history between the Chiefs and Giants. The Chiefs have won two of those meetings, including the most recent one in 2012. Game 1 will take place at the Langley Events Centre on Friday, April 19 (7:30 p.m. MT) with Game 2 the following night. The series will then shift to Spokane for the next two games. Game 3 will take place Tuesday, April 23 (7:05 p.m. MT) with Game 4 on Wednesday, April 24 (7:05 p.m. MT).